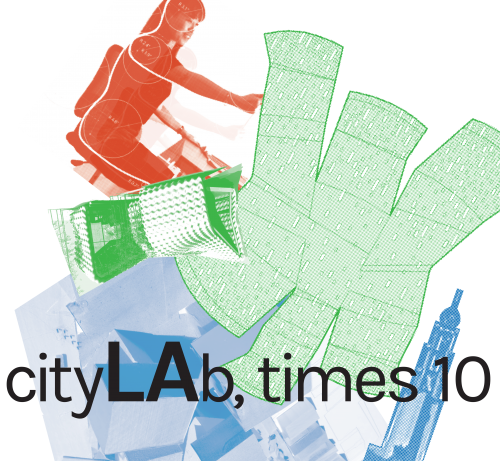 Founded in 2006 at UCLA, cityLAB is a think tank devoted to the contemporary city’s architectural and urbanist issues. Currently on view at the A+D Museum cityLAb, times 10 looks at how six original design ideas can scale by the “powers of ten”, and evolve for the uncertain future of the next ten years. The forum spoke to cityLAB’s director, Dana Cuff, about how to look forward. How did cityLAB come about? In 2006, I started cityLAB at UCLA with Roger Sherman. Hurricane Katrina had just wiped out New Orleans, and most of us architects felt powerless. We realized that Los Angeles needed a design-research think tank, where complicated urban issues could be explored through new kinds of architectural practices. cityLAB is really a series of projects that we initiate and then find ways to support the research and design effort. What are some of the most pressing issues facing our cities today? cityLAB has five basic initiatives that guide all the projects we create, and these reflect current critical issues that we believe architecture can address: the post suburban metropolis, spatial justice, new infrastructures, rethinking green, and urban sensing. Every one of our projects experiments with new ideas around clusters of these basic notions. For example, the BIHOME starts with the idea that L.A.’s suburban DNA could grow more affordable and more sustainable by doubling the density of the single-family lot. We’ve spent ten years working on various aspects of that idea – leading most recently to the demonstration house we built up at UCLA and AB2299, a state law we co-wrote that Governor Brown signed into law in January of this year, making “granny flats” much easier to build. Your show at the A+D Museum is projective instead of retrospective. What lead you to make this decision? It’s our tenth anniversary, but a retrospective seemed totally out of keeping with cityLAB’s forward-looking mission. So I decided to feature three sets of projects that are thematically linked and exhibit our way of working – how ideas are studied through traditional research as well as design, the value of demonstrations or prototyping, and how that leads to the next set of experiments. Then, to look forward ten years, we invited many young architects to submit proposals about L.A.’s future. A jury selected six, and cityLAB sponsored those teams to develop their proposals into the installations at the A+D. Where would you like to see cityLAB in 10 years? I hope cityLAB will be established as the go-to think tank for research and design about Los Angeles’ future. I hope we have created a solid, collaborative network of community activists, professionals, and civic leaders to build a more inclusive, just, and dynamic city. I’d like to cityLAB to be central part of making L.A. the model of great urbanism in these politically destabilizing times.